What is the 2018 theme? This year’s theme for Mental Health Month is “Share the Journey” -The main message is to encourage individuals and communities to connect with others and recognise how important this is for our mental health and wellbeing. Good social connections are important for our health and survival – they help us with our journey to better mental health and our ability to cope with life’s struggles. They not only improve our overall wellbeing, they also build our resilience. Nearly half of all Australians (45%) will experience some form of mental illness during their lifetime, and those that don’t will most likely know someone that does. But there’s still a lot of stigma and confusion around the topic and that’s where learning and growing comes in. It’s important to make sure that as many people as possible know what mental illness looks like and what can be done to treat it – even if it’s not an issue for you right now, it might be one day, either for you or someone you know. The theme also encourages everyone to learn new and exciting things, as the very act of learning can have many positive outcomes on our mental health and wellbeing – no matter what you choose to learn about. WayAhead have produced a Share the Journey Fact Sheet with more information on the theme and we have translations available in Arabic, Chinese, Farsi, Thai and Vietnamese. What is Stress Less Day? 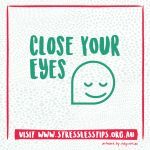 WayAhead’s Stress Less Day is held annually on the last Sunday of October’s Mental Health Month.This year’s Stress Less Day is Sunday the 30th of October. Stress Less Day is a great opportunity for people to make time to do things that are fun, relaxing, and enjoyable with their loved ones. What is Mental Health Month? 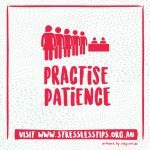 Mental Health Month is celebrated each year in the month of October in NSW.This awareness month encourages all of us to think about our mental health and wellbeing, regardless of whether we may have a lived experience of mental illness or not.This month also gives us the opportunity to understand the importance of mental health in our everyday lives and encourages help seeking behaviours when needed. In today’s society, most of us face increasing commitments. Unfortunately, with so many commitments in our lives, our mental health & wellbeing can become less of a priority.This year, we are focusing on encouraging individuals and communities to connect with others and recognise how important this is for our mental health and wellbeing. WHEN IS MENTAL HEALTH MONTH? 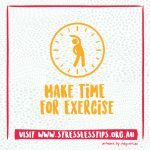 The month of October is Mental Health Month for NSW.This is a national mental health promotion campaign held annually through the month of October.The timing of the campaign centres on World Mental Health Day, which is marked each year on October 10th and incorporates ‘Stress Less Day’ – Sunday 30th October. Mental Health Month is a useful reminder for all of us to think about the men- tal health of ourselves and those around us. It’s a great opportunity to engage all members of the community in activities that can enhance their mental health and wellbeing. It’s also a good excuse to get out there and have some fun! WHERE CAN YOU FIND OUT MORE ABOUT REPORTING ON MENTAL ILLNESS IN OCTOBER? A much quoted figure is that one in five Australians will be affected by a mental illness in any year. This was the finding of a 2007 Australian Government National Survey of mental health and wellbeing. Against that background, Mental Health Month seeks to promote mental health and wellbeing by giving communities the opportunity to discuss and celebrate mental wellbeing while promoting the services and supports that our community is increasingly providing. WHAT IS MENTAL HEALTH VS. MENTAL ILLNESS? WHO RUNS MENTAL HEALTH MONTH? WayAhead (formerly the Mental Health Association NSW) is the second oldest mental health charity in NSW. Our vision is a society that understands, values and actively supports the best possible mental health and wellbeing.We work in partnership with others to promote mental health and wellbeing through education, support and advocacy. WayAhead plays a vital role in the development of mental health initiatives which result in increased community awareness and knowledge of mental health issues. 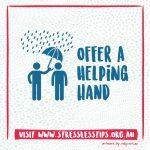 Some of our programs include providing support groups across NSW, our Mental Health Information Service and Anxiety Disorders Information Service phone lines,WayAhead Workplaces – to promote workplace health and wellbeing, and popular health promotion campaigns such as Mental Health Month, perinatal depression and anxiety awareness week, and OCD awareness week. October’s Mental Health Month in NSW is launched at NSW Parliament House with the Mental Health Matters Awards.The Awards recognise outstanding service by organisations or individuals in mental health. A secondary school catering for a large aboriginal population with a fantastic mentoring program. A media award for a thoughtful and sensitive story on bipolar disorder. rural service providers who cater for geriatric mental health. And an Arabic psychological wellbeing initiative that provides evidence based treatment that is sensitive to the cultural needs of this rapidly growing community.